As we near the halfway point of the year, the top bathroom trends of 2018 are already making themselves clear. Last year, we saw freestanding tubs and monochromatic design take the helm. And while these trends add an upscale vibe to bathrooms, they didn’t quite revolutionize bathroom design. This year’s trends, however, are primed to change everything about the way your bathroom looks. Wet rooms encase a shower and freestanding tub in transparent glass. If 2017 was the year of the freestanding tub, then 2018 will be the year of the wet room. Building off last year’s popular trend, wet rooms typically encompass a freestanding tub with a shower space, encased in tile with a glass divider. As their name suggests, wet rooms are entirely built with materials meant to get wet. By keeping the shower completely transparent — without a wall, curtain or even a curb — the bathroom feels significantly larger. Plus, this trend offers the added advantage of universal design. That means homeowners will be able to “age in place.” This is a huge benefit for any homeowner who wants a “forever home,” but particularly for the baby boomer generation, which is one of the largest living generations in the United States. For this reason, a design feature like this might even be able to increase your home’s value. Heated wet room flooring and built-in benches are great complements to wet rooms. By heating the bench, homeowners can ensure that they get the most use and comfort out of it — because nothing feels colder than stone or tile just after stepping out from a hot shower stream. 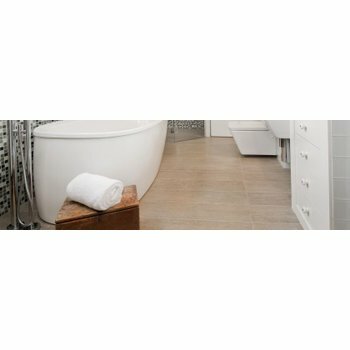 If you’re redesigning your bathroom with a wet room, now’s the time to consider heated wet room flooring. Electric floor heating systems are easiest to install during a remodel when the flooring is already torn up. Contact your local contractor and electrician to have the floor-heating work done in tandem with the rest of your remodel. In the end, you’ll have a warm, relaxing wet room that you’ll look forward to each and every day. Gray is the new beige. Numerous shades of gray are taking the spotlight on walls, tile and even cabinetry. But no matter which shade you choose, it’s likely to leave your bathroom looking cold. It’s just the nature of the color. To remedy that situation, homeowners are turning to brass — but not quite the same polished brass from the 80’s. Today’s brass typically has a brushed, matte or satin finish, giving it a more luxurious look. This metal is showing up on cabinet hardware, light fixtures and mirrors. It’s an accent color that adds warmth to an otherwise cold bathroom. Brushed brass hardware, mirrors and lighting fixtures warm up the gray tones in this bathroom. Traditionally, homeowners turn to the bathroom vanity or a linen closet for their storage needs. However, in 2018, storage is getting a little more creative. For farmhouse or industrial styles, a vintage piece of furniture can be repurposed and used as a focal point of the bathroom. This adds interest to the space while providing a necessary function. Open shelving also offers a great solution. If your bathroom is going to be redesigned with brass hardware, you can continue this trend to the shelving. Or, simply keep to the room’s general style, whether that be modern, rustic, etc. Regardless of the type of open shelving you choose, putting your towels and toiletries on display will undoubtedly make the room feel more open and airy. Open storage, a floating vanity and a large mirror make this bathroom feel larger and more open. Nothing says comfort and luxury like heated bathroom floors. Electric and hydronic (hot water) versions are available, but electric systems are ideal for remodeling projects. That’s because most homes are already equipped to handle the extra amperage, so the system can be easily tied in to the home’s existing circuit. Hydronic systems, on the other hand, require a boiler, pump and gas lines, making them more difficult to retrofit into an existing home. As mentioned earlier, heated floors offer an added bonus in wet rooms, but they’re also an option for the entire bathroom. Electric floor-heating systems can cover the majority of the room, providing warmth and comfort with every step. Or, homeowners can choose to heat only the “high-traffic” areas, like in front of the vanity and toilet. Either option is available at an affordable price. Considering the size of a typical bathroom, you might be surprised at how inexpensive heated floors can be. To find out how much it would cost to heat your particular bathroom, check out WarmlyYours’s free, instant Radiant Heat Cost Calculator. 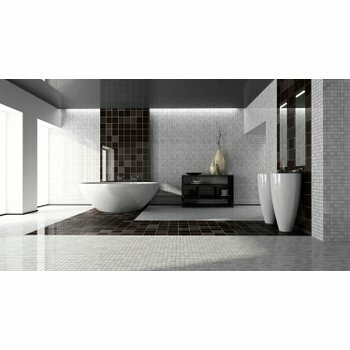 Heated bathroom tile adds comfort and luxury to any bathroom. While white subway tile is a lasting trend, more interesting tile choices are coming to the forefront. Designers are encouraging homeowners to use bold colors in wall tile as well as unique shapes like arabesque, chevron, Moroccan fish scales and hexagon. Getting even more creative, three-dimensional tile is gaining popularity. This tile typically enlists a geometrical design that adds depth and character to any bathroom. Accent your shower with some 3D tile and it’s sure to be a standout favorite. Moroccan shaped tiles accentuate this shower. 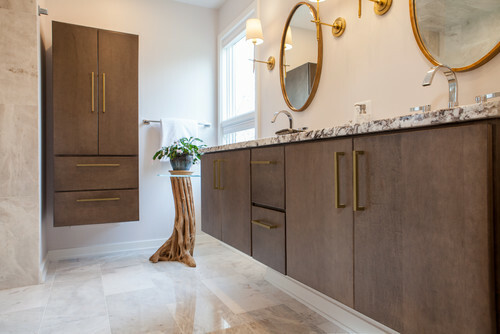 More and more homeowners are adding floating vanities to their bathrooms as the trend ditches its “modern only” ties and appeals to all home styles. Floating vanities hide all the plumbing inside, leaving the cabinetry “floating” above the ground. This gives a more spacious, open look to a bathroom. In 2018, floating vanities can suit any home style. Smart showers are one tech feature of bathrooms in 2018. Finally, bathrooms in 2018 are getting “smarter” than ever. We’ve heard about smart toilets with seat warmers, automatic lid openers and the ability to even clean themselves, but technology now is spreading to the shower and vanity. Smart showers can play your favorite music and remember your ideal water temperature. And the automatic faucets that we’ve grown accustomed to in commercial properties are going residential. That’s a trend that’s both convenient and economical. These seven trends will impact nearly every square foot of bathrooms — showers, tubs, floors, walls, vanities, shelving and toilets. 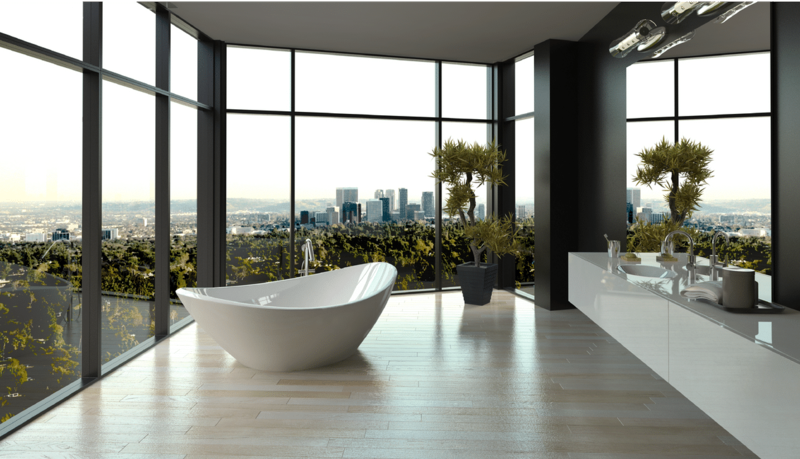 As a result, bathrooms will be more open, accessible, intelligent and eye-catching than ever before. Have you recently remodeled your bathroom with one of these seven trends? If so, share a picture with us on Instagram at www.instagram.com/warmlyyours. If you're interested in learning more about kitchen design trends for 2018, make sure to check out this great post at The Most Chic. Next Post How do Radiant Infrared Heating Panels Work?